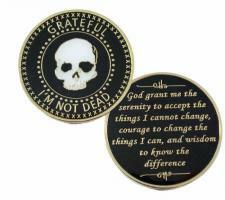 Grateful I'm Not Dead Medallion. This medallion is available in gold inlay or silver inlay. This tricolor enamel medallion features a skull on the front in white with a black background and gold lettering. The front has "Grateful I'm Not Dead" written around the outside. On the back it has the Serenity Prayer written out in gold or silver script. Please choose inlay color option.